So which famous hairdos are your favourite? Something from now or the past. I really like Kelly Osbourne's (current?) lavender hair. It makes me really miss mine and I wish I'd made more of it when I had that shade. She seems to have made pastel purple really fashionable at the moment. 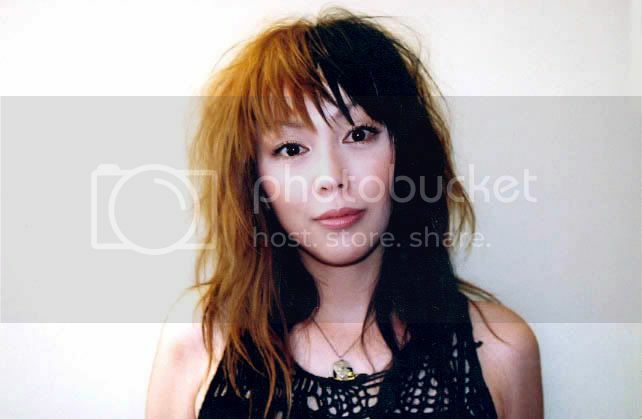 The singer from Republica (showing my age now ) had pretty cool hair too. Bonus points if you can tell me what specific dyes they used! Rihanna's pixie was the inspiration for me to make my already-short hair a pixie. For color, her red hair (whether or not it was a wig, not sure) was one of the inspirations for me to go red. So was Hayley Williams' from Paramore. I think Juliette Lewis looked amazing with blue hair! Cyndi Lauper pushed me to try orange because of her amazing hair. I only know that she used MP Electric Sunshine. "Live by the foma that make you brave and kind and healthy and happy." -Kurt Vonnegut, Jr.
Whilst I dislike her music thoroughly (I'm not a fan of pop) I did very much like Katy Perry's deep purple hair. Especially in the photos where it had started to fade. It was a lovely shade that didn't hurt your eyes. I think Stargazer Plume would be a similar depth to this, but too pink. I don't know! I also really liked Katy Perry's purple, but i felt like both the pink and the blue she had looked kind of...wrong? Murky maybe? What about Sharon Osbourne's hair? I can't tell if it's always the same, or if she changes dyes once in a while, but either way it always looks great, and changes in different lights. I think Sharon Osbourne changes hers a lot but subtly. It looks like a permanent on hers. Jaybirdy, I agree about Katy Perry's. When she had blue I just kept wanting to fix it for her haha. It always looked a bit washed out or something. I liked Katy's pink hair once it faded, although I don't think it suited her as much. In itself it was a nice colour. 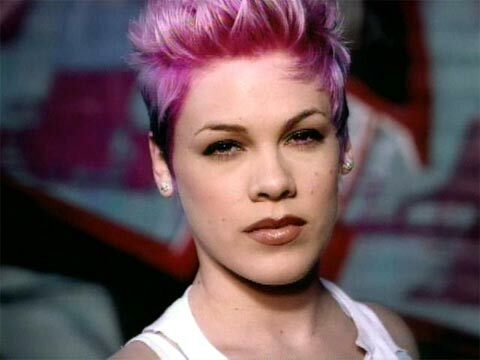 I LOVE Pink's hair. She does all kinds from bright to pastel to pinkish white. She gets away with having very similar hair all the time. It just suits her. I watched Eternal Sunshine of the Spotless Mind the other night and I haven't wanted to dye my hair so badly in such a long time. It even made me want to dye mine red and I don't suit red that much. I think Manic Panic claimed to have provided the colour? But how did they change her colour so much?! In Eternal Sunshine, her hair was only two colours, wasn't it? It was the lovely madarin deep orange colour and the dark blue? Red, orange and blue and I think green for one scene towards the end. I loved the girls from Republica's hair, the cut, the colour, everything! Was always transfixed when Ready to Go came on the telly. Love Shirley Manson from Garbages hair. Loved Gwen Stefani's blue hair. Kinda feel a bit of a '90s fan girl here! Oooh Seph Green's hair in that Austin Powers movie, thought he looked rather hot. Was it Kate's real hair? I think I can remember reading something about her hair feeling fried from it all, but not really sure now! Also they probably filmed the scenes out of sequence so just went around the colour wheel with it. I know that's how they did it with Ramona Flowers hair in Scott Pilgrim verses the world. Haircut wise I always loved Charlize Theron in Aeon Flux, but I am afraid that will never work with my face. You're right, I just looked it up, and I was misinformed! A die hard Scott Pligrim fan I know used go on these really long fanboy rant's about how dedicated Mary Elizabeth Winstead was to the roll, and how she dyed her hair for it, and read all the comics, and spent ages talking to the author to get into character, and I honestly never questioned anything he told me! My bad! katox wrote: Was it Kate's real hair? I think I can remember reading something about her hair feeling fried from it all, but not really sure now! Also they probably filmed the scenes out of sequence so just went around the colour wheel with it. I think so. She had roots showing for most of it, except when it was red and the roots were hardly visible but still there. If not they were extremely convincing wigs! I never saw Katy Perry with purple! It looks really nice on her! She's not super famous or anything, but Mishkin Fitzgerald, the lead singer and pianist of Birdeatsbaby has been a big inspiration on my hair. Especially when I cut it all off last summer. I also like what Demi Lovato recently did with her hair. It reminds me of Rachel McAdams's blonde to pink hair. I love Davey Havok's hair. He's the lead singer of AFI (A Fire Inside). Every day I wake up and I'm a canvas, and I'm creating who﻿ I am for that day, and for my life. I totally forgot that one of my celeb crushes has crazy hair until I saw him again last Sunday! He is Les Hall, guitarist for the band Crossfade. And please excuse my terrible face and messy hair... I was a little more than excited to get to talk to him. Aaah that hair is excellent (both of you )! Jude wrote: Aaah that hair is excellent (both of you )! yea i totally agree with Jude! He has fantastically spiky hair... it looks like ice or something! Crazy hair for crazy times! 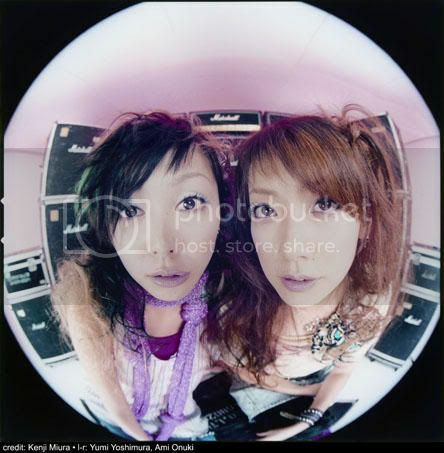 One of my favorite musicians is the pop and rock duo PUFFY, comprising of two women: Ami and Yumi. Ami is on the right and Yumi is on the left. They both have great fashion sense and fun hair. Yumi is more adventurous with her hair than Ami is. She is also prone to having shorter hair for a unisex style while Ami usually has long hair about midback. I've copied a few of Yumi's hairstyles and there are still some that I want to try. Being male, I have to modify the longer hairstyles to fit my shorter hair because it takes so long for me to grow my hair and also because I don't look good with long hair anyway. I really like two tone hair. It seems to be a pretty popular trend among Japanese street fashion. When people do it in America and other western countries, it's usually platinum blonde hair on top of black. I like the way that Japanese people do it, where the shades are side by side. Some scene kids and others in western countries have streaks of colored hair, so they're side by side that way, but it's not like the Japanese style. I tried the three-quarters-brown-and-one-quarter-blonde hairstyle for a while in 2006. It was a disaster. Instead of being two-toned, my attempt had me with at least two shades of brown and three to five shades of blonde because of uneven bleaching. On top of that, the length of my hair was uneven. Being male, I had the typical short hairstyles before, so when I grew my hair longer, the hair at the back of my head was longer than the hair on the sides of my head, which in turn was longer than my bangs/fringe. So I had the brilliant idea of evening my hair by cutting it all around, giving myself a bob just level with my chinor a bit past it. Yes, a male with a bob hairstyle. I told you that it was a disaster. Then, later, my black roots grew, so I then had maybe about an inch (2.5 cm) of black showing through the different shades of brown and blonde. I'll probably do it as a green mohawk worn flat (I don't like mohawks up) with my natural black hair shaved close on either side. I'm thinking maybe shaggy hair seen on some men (longest hair would be a bit past my ears), with brown on top of black, and the bit of green on one side. I won't do the light blonde and green tips at the back of the head. I don't think that the lighting could change the color by that much, can it? The sun changes my blue hair in certain angles (heck, it changes my natural black to a dark brown), but that above photograph seems too different to be caused by lighting. I don't have any other explanation for it, though. 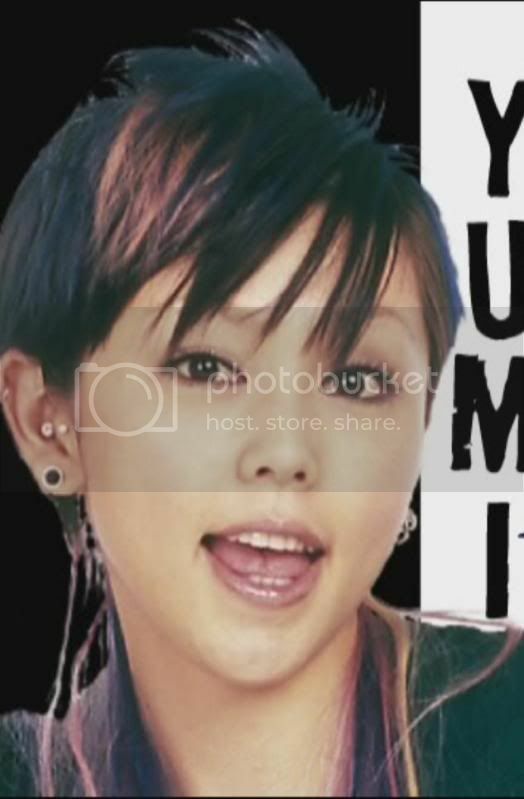 Yumi had this hairstyle way back in 2004 and I've wanted it since then. I've attempted to get it maybe two or three times since 2004 but I failed every single time. The cuts that I had weren't even similar. Couple that with the dye job always coming out dark because my mother didn't bleach my hair light enough. She doesn't like the idea of using bleach on my hair to get it to blonde because she's afraid that my hair will get fried going from black to blonde, so she'd only lightened it to about a medium brown or light brown. Brown has red in it, so when she added the blue dye, my lightened hair turned purple. It didn't start looking blue until the color started to fade. Then it only stayed blue for maybe a week before then turning green. Now, I've done my own dye job, so I can lighten my hair to as light as I want to achieve the true dye color. I used After Midnight by Manic Panic. It's still in-process. I have the blue over my black hair with a blonde streak on the right. Because I accidentally dyed part of my blonde streak blue, I'm using Effasol to fade it. I've already faded it twice, waiting about twenty four hours in between applications. The first application made the blue fade very quickly to a bright pink. Seriously, just from applying the mixture to my hair with a tint brush did my blue mistake fade to pink in less than a minute (really, about ten seconds!). I've managed to fade the blue mistake to a light pink, so I just have one more Effasol application to do, I think. I'll do it in about an hour or two, which will be at least twenty hours from the last Effasol application that I did this morning. It's 11:29 p.m. as I'm typing this. Yep, staying up at night to dye my hair. Who needs sleep? After I fade the last remaining light pink tint tonight (or rather, tomorrow morning), I'll dye my blonde streak with a permanent light reddish blonde. That's what it originally was but the bleaching for the blue made it lighter (originally, my hair was just black with that brown streak, no blue; I then applied bleack to the black hair and to the black roots of my brown streak, but I had accidentally gotten bleach on the already bleached-brown streak). Now the two Effasol applications made the brown-to-blonde streak even lighter. It looks like platinum blonde, as if I'd used a toner! Then I'll use black permanent dye to dye the sections of my hair that should be black but which I'd accidentally lightened with bleach when doing the initial blue application (it's mostly my bangs area, but some of the hair around the blonde streak was also accidentally lightened). I think that I can do the permanent light, reddish blonde and black dyeing after I rinse out the Effasol and shampoo my hair. The permanent dyes are supposed to be deep conditioning, so I don't think that I have to wait twenty four hours after the Effasol application before doing more stuff to my hair. I also have to then touch up my blue hair. It's fading to purple, but only on the right side and on the top of my head. The left side is the dark blue that it should be. Also, it's the tips that are fading to purple on my left side and top of my head. The hair closer to my scalp on my left side and top of my head is still blue, while the back of my head and left side are varying shades of dark blue. I don't know if it's maybe because I didn't use enough dye on the tips or maybe my tips weren't lightened enough. Oh, and there are still some strands of my hair that are still actually the shade of pink from the first and/or second Effasol application. I didn't bother fading those strands any further because they are part of my hair that actually should be blue, so I'll just add blue dye to them. I just hope that the pink won't affect the blue dye, resulting in purple! I'm only supposed to have three colors in my hair (dark blue over black with a reddish streak on the right side of my head), but instead, I have two to three shades of dark blue, one or two shades of purple, platinum blonde, dark brown, and black. That's at least six colors, at least double what it should be! Yeesh, I didn't mean to type an academic paper about my hair nor did I mean to post so many pictures of PUFFY. It's just that I don't have anyone else to tell about my hair (or about PUFFY's hair, for that matter). That's what this community is for, isn't it? Now it's 1:03 am (it took a while to gather images for this post and to check for grammar mistakes). Off I go to soon apply the next (and hopefully final) Effasol application. So many hairstyles, so long to grow hair! Want Vibrant Evilla D Ark like hair, hairdresser said my hair cant get there will be darker. Is all of my hair going to fall out?